What bulb should you purchase? There is a lot of choice when it comes down to purchasing light bulbs; there are a variety of styles, brightness, cost and sizes to put into consideration. 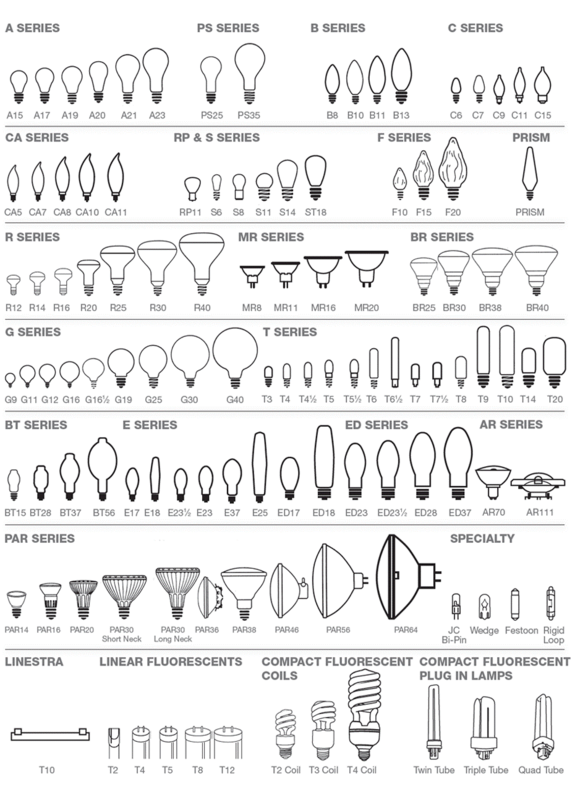 This guide is here to help you find what bulb you need for your lighting fixture and help you choose an ideal bulb for your environment! The aim of this is to help provide you with a better understanding of how bulbs work and how they should be used, this is split into different bite sized categories to help. The conclusion you should have for yourself is which ones you should use and in which way. The type is referring to what the bulb is and how it functions. There are four main types described within section (the most common). This is the most standard bulb on the list as it’s the most recognised and the most purchased… but is it the most useful? Well, no. This has been the standard since the creation of the bulb in 1878. It’s seen as the weakest with its very low life expectancy and high cost annually. It works by heating it’s wire filament with a high voltage which in turn makes it glow (making it visible when no light is present). The incandescent can only produce one colour as it can’t intake too much of an electric current (watt) else it can blow, this adds an additional disadvantage because of its limited amount of brightness produced (as any of the other bulbs listed). Unfortunately, with each switch (turning it on and off) it loses some of its integrity which is why they tend to blow instead of dim over time like the rest of the featured bulbs. The next on our list is a modern classic in the bulb world. Slightly newer then the incandescent lamp comes the halogen bulb, this is a vast improvement over the previous technology. These came out in the mid-1960s almost 60 years after the incandescent and has a vast amount of improvements such as its smaller compact size, ability to shine brighter with less watts and colours (such as you can get a warmer cosy light rating). The halogen can produce greater colours because the bulb can operate at a higher temperature. They produce light with the combination of halogen gas and with its tungsten filament which produces a halogen cycle chemical reaction which redeposits evaporated tungsten to the filament, increasing its life and maintaining the clarity of the envelope. CFL is short for compact fluorescent; the name is due to its compacted state (the product is also known as the energy saver lamp). The CFL was built to compact the large annual cost from the standard halogens and incandescent… and it does this well. On average, the user of a CFL can save around 70% annually! (1/5 to 1/3 of power used) But at a disadvantage it can take from 30 seconds to 3 minutes to reach its max brightness (because of the way it works). The bulb works by running an electrical current though a small tube which contains argon and mercury vapor. This will produce an ultraviolet light that excites the fluorescent coating on the inside of the tube which in turn emits the light. You can find CFLs in all shapes and sizes as they can come in tubes for kitchens or come as a standard for your ceiling lighting (minor examples). You can also expect a large life span from this bulb. LED is a term which is passed around a lot lately (properly because they are the current trend in lighting) it stands for Light-emitting diodes. You can find them in most gadgets with a light! When it comes to LED bulbs we are quite bias, but this is because they are the most efficient at cost, life span and brightness. Of course, there are some down sides, for one they tend to get hot (and quick), and some people have said they can be too bright. In the mix of its best quality is it can produce colours such as warm white, natural white and is currently the most future proof out of the all the bulbs listed. They work by moving electrons arounds its semiconductor structure. A semiconductor is made of a positively charged and a negatively charged component. The positive layer has "holes" -- openings for electrons; the negative layer has free electrons floating around in it. When an electric charge strikes the semiconductor, it lights. From this chart you should be able to find the best fit for your needs. In summary; if you want to pay a small amount to start with you should consider getting an incandescent bulb, if you fancy something in between get a halogen, if you want to save a lot in energy, head for the CFL else if you would like something more future proof and would like large savings, go for the LED. The purpose for bulb advancements is for the growing marketing, the adjustment for modern lighting and more. There have been enormous improvements within the past 100 years! The focus was on how to improve the life span, the brightness, the sizes and more. There are a numerous number of bulb types and caps, such as the G9 and B22. Which when compared are different shapes and sizes; but aren’t they used for the same thing? Lighting? Yes, but they have been built for different purposes such as the G9 can be used on chandlers to add more emphases to the crystal, while the B22 is a slimmer version of the standard bulb and is ideal to provide lighting in spotlighted placements (these are two examples of many). Each light fitting purchased will only accept the bulb which matches its lamp cap, for example a chandelier will most likely only expect a G9 (because of its size and positioning). The reason why there are multiple lamp caps is based on size (the smaller a bulb the smaller the base will be) and wattage (a higher wattage will need more conductors). •	The first letters indicate the type of base or cap, such as Bayonet or Edison (B | E). •	The numbers indicate the diameter of the base or the distance between the pins in milli-metres. •	The last letter is optional. It indicates the number of pins or contacts the base has and can usually be found on architectural and strip lights. •	Heat removal - Due to the essive amount of heat given by a single bulb, some bulbs are adopted in shape to help remove some it, such as gu10s which has a large area and heat sink to spread the heat. •	Handles heat – Not necessarily heat remove as above; some bulbs are built to handle the heat. Due to the usage of martial and glass. An example is a G9 which uses a coated plastic to absorb heat. •	Wattage – Some are built to handle more wattage, and some are built to handle less wattage. A large bulb will need to be connected to more conductors to get the recommend wattage, a smaller bulb would be built to take in less wattage. •	Reach – Reach is referred to the amount of surface area light will hit. Some areas in a house will be larger than others, and cause of this a bulb which can get more spread more will need to be used. An example is the B22 which its purpose is to light up as much as possible. •	Size – Size plays a large factor. As mentioned, a chandelier will have smaller lights placed apart rather than using a single larger bulb, this is to spread more lighting and keep it looking classy, such as the G9s. •	Adjustable lighting – With the rise of adjustable lighting comes the need for a bulb to adapt to these modern fixtures. This kind of fitting will need a lamp to absorb heat, so the user doesn’t get burnt, as well the lamp will add a spotlight to the focused area upon adjusting. •	Design – Some bulbs are created purely for design; to add that touch of elegance and class. A light fitting which cost a lot in value would go well with matching bulbs, an example would be a candle based bulb for wall lights; adding a classic effect. •	Angle – Some areas are hard to hit for standard bulbs, this is a large issue for larger and modern rooms. This is tackled mostly by reflected bulbs such as GU10’s. The angles also provide a spot light for specific areas such as doorways or wall art. When purchasing a fitting or feature it should come with a recommend bulb. If you need any more help with choice you can contact us or pop into a branch. What is a lumen and a watt? A lumen and a watt go hand in hand. A watt is a unit of measurement for an electrical charge. A lumen is a measurement of lighting (the amount emitted by a bulb). They go hand in hand because a watt will be used to provide the lumens, therefore they are usually seen together (A watt is a current which will be pushed thought a light bulb and provide the light (the lumen) by providing a circuit). An example is a 75w incandescent bulb will provide 1100 lumens. This is because when 75 watts are charged into the bulb the light generated will be measured at 1100lms. This example only works for incandescent bulbs as other bulbs require less watts to power (because of their structure). This is why the LED bulb was created as it requires less watts but provides more lumens, saving money and power daily. You can get an ambiance colour by coloured bulb glass (red blue green etc) but within this section we are referring to colouring by temperature. In layman’s terms, the hotter a bulb gets, the greater colour it produces. The temperature is recorded in “kelvins”, the term used for this is CRI (colour rendering index). The number of lumens is still the same, so the true brightness is not affected by the colour. What bulb to use in what room and for what task? What task is your lighting used for. What colour you should be using. How bright you should keep the room. Will this fit my light? Will using energy-saving light bulbs save me money? How can I dispose of used energy-saving light bulbs? If a light bulb fails, can I get a refund? Or use the contact form on the footer or use the live instant massager service.